My name is Chase Manley. I am 25 years old, a bicycle mechanic, avid cyclist, welder and as a hobby I design & fabricate recumbent trikes housed in aerodynamic shells (AKA Velomobiles). I have been doing this since I was 17 years old. 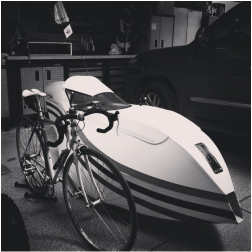 I built my first velomobile from the ground up as a personal project to travel from Chicago, IL to Fort Collins, CO. over my junior & senior year of high school. I called the trip Trike Trek '11. ​ My creations up to this point have been experimental demonstrations of the capability of the human body to transport itself efficiently & comfortably. To improve my mechanical, fabrication, design and machining skills indefinitely and to become a master of my craft in order to create products that inspire, entertain or otherwise enrich the lives of others.